This coming weekend marks the closing date for final turns at many of the ski areas to our north. Not all, but most. Bromely is already closed, as are most if not all of the smaller, more southerly ski areas. 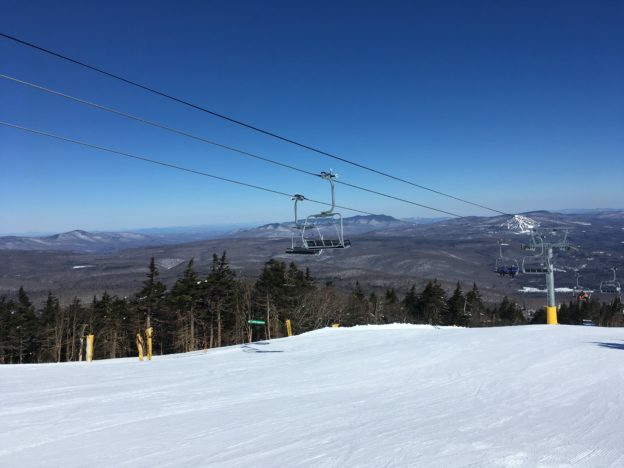 Okemo, Stratton, Mount Snow, Loon, and Bretton Woods are all slated to stop operations this Sunday, the 14th of April. Stowe and Sunday River have planned closing dates of Sunday, April 21st. Smugglers Notch the same, but not open weekdays next week, just open for closing weekend. 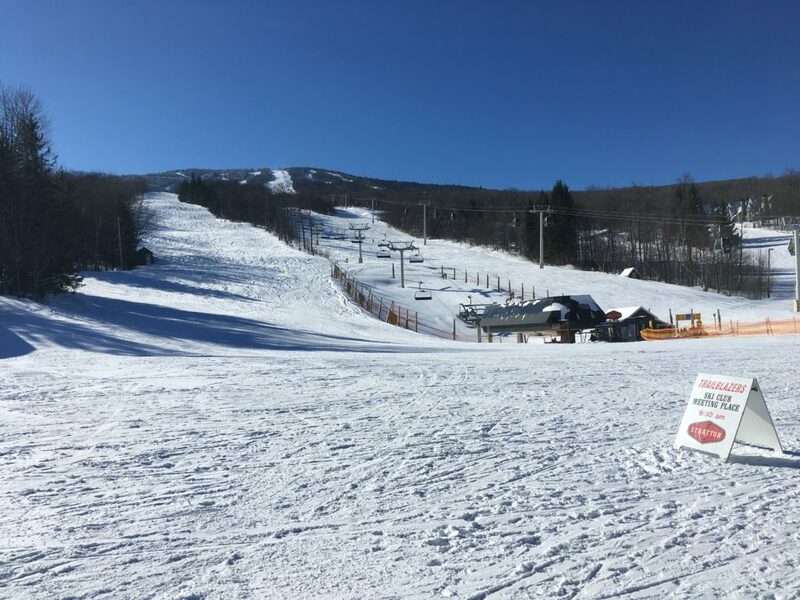 Sugarbush closed Mount Ellen already, leaving Lincoln Peak open, and hasn’t posted an official closing date, but there are hints of being open into early May if skiable conditions persist. 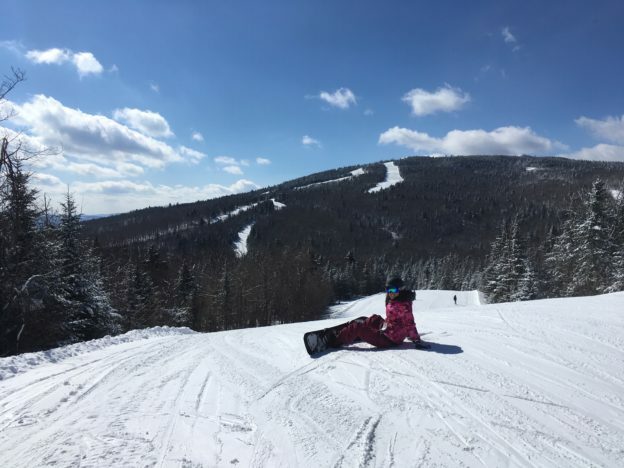 Killington and Sugarloaf are, as we know, open well into May, conditions permitting. Killington has some major on-slope events planned on weekends right into May. And with the depth of snow they have piled up on Superstar, you can be sure they will have that trail open deep into May. Bottom line is, if you want to get in a few more turns on your favorite ski mountain, you better plan to get out there soon. Really soon. And after you take that final slide down the mountainside, be sure to bring your skis or snowboard into Avie’s Ski / Sports for a final tune of the year. That final nicety will keep your skis or snowboard in fine shape through the summer, ensuring that you are set to ski or ride when that first lift spins next winter. Sure, you can chuck your gear in the closet, or a dark corner of the garage or basement, but you won’t like what you see next fall. Do the smart thing — have your gear tuned at end of the season. Better still, if you value your skis or snowboard, have Avie’s “summerize” them. The coating of wax saturates the base as it is applied with a hot waxing iron. The dividend this pays next season is that your skis or board holds wax better, longer. Meaning you beat friction for longer, meaning you slide along faster. The transition to summer is happening right now at Avie’s. But there is still time to shop for winter gear. Stop in and check things out. You may find some bargains. The curtain of cold falls with a grand “Ta-Da” closing this act in our annual seasonal play. When the curtain lifts, spring is here and summer not far ahead. Time to chase the spiders out of the kayaks, get some new tennis balls, find that paddle board paddle and leash, and get out and have some fun in the sun and warmth. This entry was posted in Gear Knowledge, Snow Conditions on April 11, 2019 by Alan Desbonnet. Stratton + Stratospheric = Strattonspheric! I decided to make a run up to Stratton this morning. I’m glad I did. It was Strattonspheric. That means it was other-worldly good. Outta-this-world good. Look at the picture, taken from the summit near the top of the new Snow Bowl lift. I think that’s proof enough that my decision was a good one. A really good one. That’s Bromely Ski area center right. Way off in the distance, not really noticeable in the image here on the webpage, unfortunately, you could see the snow-capped twin summits of Camel’s Hump. Stowe off behind that—I think. That’s how crystal clear a day it was. Okay, so you give me a high-five for a great day of sightseeing in Vermont. What you really want to know is — How was the skiing? It was phenomenal. Stratospheric even. Despite it being clear and sunny, it was cold. In the teens at the summit and mid-twenties at the base. And it stayed cold. With a breeze that wasn’t quite a wind. The snow stayed firm-and-fast on the upper mountain, with lower mountain trails softening up just a bit. Not so much as to be sloppy or “grabby.” Just nicely soft. The snow they received over this past weekend gave the mountain operations folks a chance to make a major “reset” on the trails. The St. Patrick’s Day Avie’s bus trip to Okemo experienced “groomed variable surfaces,” which translates to “chopped ice.” Not that those conditions were bad, they were actually quite good. But the snow today at Stratton was delicious, good old packed-powder. It was spectacular. Grizzy—a Double-Diamond to the left off the Ursa lift, was fully groomed top-to-bottom. First time I had seen it groomed this season. It was spectacularly fun. Multiple times. As was Polar Bear, Black Bear, Tamarack, Standard, Spruce, Drifter, Sunrise Supertrail, and Down’easter. To name a few. Time to Act Is NOW! Bottom line is that conditions are incredibly good right now to the north in ski country. Take advantage of it. Read this, then call in sick for tomorrow. Go skiing or riding. It will be worth the effort. You won’t regret a moment. Some warmth creeps in towards the end of the week, which will make for some good spring skiing and riding, for sure. But if you like your snow-covered slopes to be firm-and-fast, go tomorrow. Leave tonight if you can so you can’t change your mind. Yes, the ski and ride season is winding down. Resorts will be reducing access day-by-day, and trail counts will dwindle. All the more reason to get out there one more time. Or two. Maybe three? It’s on my agenda. Maybe see you out there. 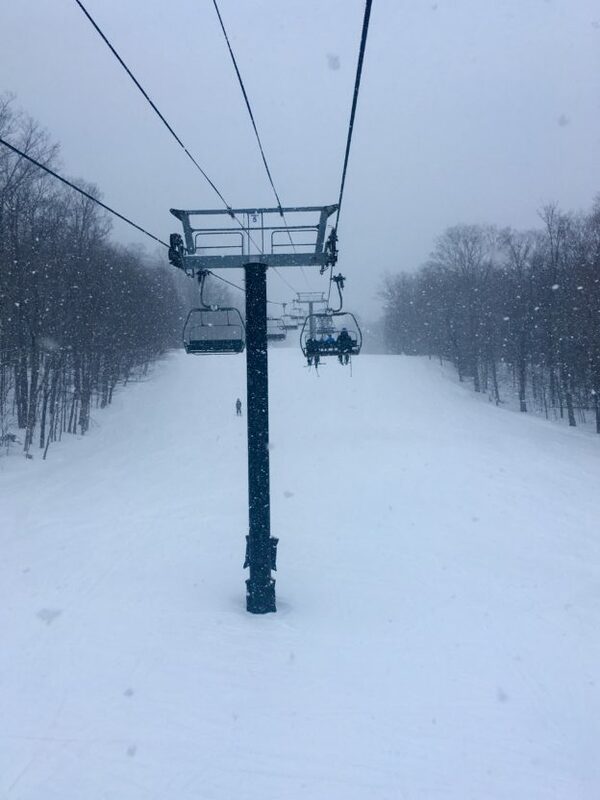 This entry was posted in Snow Conditions and tagged ski, Stratton on March 26, 2019 by Alan Desbonnet. This Sunday, March 24th, is the official last trip of the Avie’s Ski / Sports Ski & Ride Bus Trip season. And that final bus is going to Loon Mountain in New Hampshire. Right now, Friday morning, it is snowing at Loon. Snowing hard. In fact, they are expecting 5-8 inches of snow up there before it ends tomorrow morning. Then it stays cold through Saturday, meaning not much of it melts. Sunday however, sees the temperature slide up into the mid-40s. And sunny. That means some sweet, soft, buttery turns at Loon. Yes, spring skiing at it’s best. Nice fresh snow and nice warm sun. The trip to Loon is a definite “Go!” There are some seats left, but given the predicted conditions, empty seats may fill quickly. Get to Avie’s and get signed up for that trip! The last chance, last trip this season! Sad but true. This entry was posted in Snow Conditions, Store Events and tagged Loon on March 22, 2019 by Alan Desbonnet. 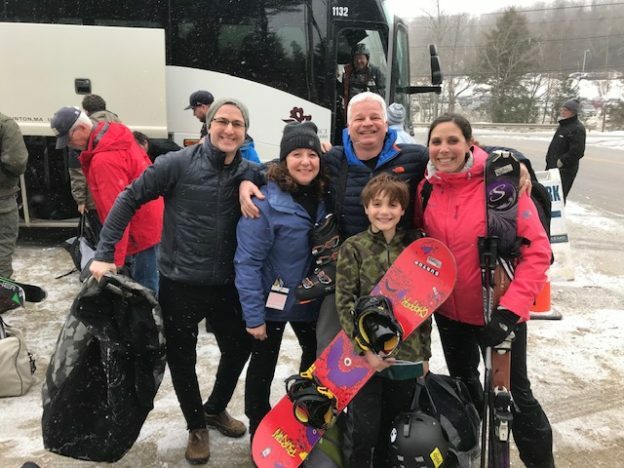 47 skiers and riders embarked on a bus from Avie’s Ski / Sports on Sunday March 17th—St. Patrick’s Day. It was also Avie’s Customer Appreciation Day. The bus went to Okemo. Ted and all the Avie’s shop employees were onboard for this special trip. While there was no corned beef and cabbage, Ted had plenty of coffee and donuts to go around. Everyone was well fed and well caffeinated when the bus arrived at Okemo. While St. Patrick’s Day is known as a day of green, this one was white. As the bus pulled into the lot at Okemo, it was snowing. Hard enough so that you couldn’t see the upper mountain. On the mountain, conditions were firm and fast throughout the morning. Okemo, true to its claim to fame, did an incredible job grooming the slopes. Recovery from the two previous days of temperatures nearly into the 60s was incredible. Everywhere on the mountain snow coverage was good to great. Great was found on most of the main mountain face trails. The sun popped out in the afternoon and warmed things up a bit. This made for some nice soft turns, especially along lower mountain trails. The sun, the light breeze, and the soft snow was a reminder that spring is nearby. All in all it was a great day on the slopes at Okemo. Skiers and riders had a fun time in the early morning snow and chill, and in the warm afternoon sunshine. Inside the lodge a leprechaun was greeting Avie’s skiers and riders at lunch. At days end, tired skiers and riders relaxed around the fire pit, swapping stories about the days adventures. But alas the day closed and the group followed it’s leprechaun leader back to bus for the trip south. Big smiles were everywhere. 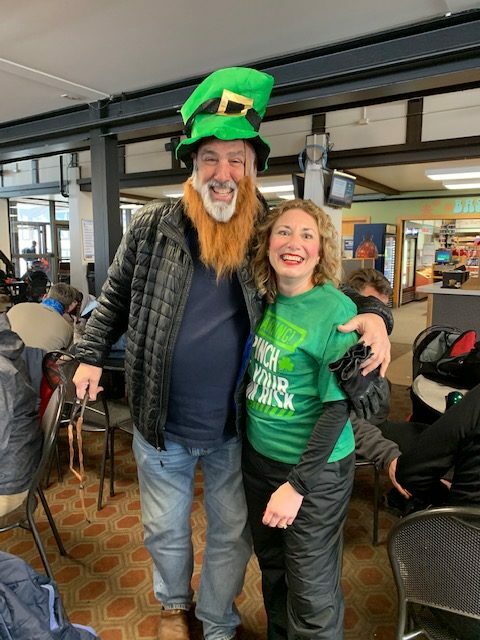 The great day on the slopes was followed by the leprechaun giving out some St. Patrick’s Day cheer. Drink koozies, warm knit hats—some with pompoms—T-shirts, goggles, and more. The leprechaun made what seemed like endless trips up and down the aisle of the bus bearing gifts. Clementines, cookies, string cheese, and more. Finally the onboard movies flickered onto the screen, and everyone settled in to chill and relax for the last part of the ride back to Waterford and then Westerly. It was a long day, but a great day. Usually the Customer Appreciation Day Trip is the last ski and ride bus trip leaving Avie’s Ski / Sports for the season. But not this year. There is one more opportunity to get on the bus from Avie’s. The final trip, Sunday March 24th, heads to Loon Mountain in New Hampshire. Seats are still available, so stop in and sign up if you want a day of fun on the slopes. Ski country to our north is still covered in white. But it won’t last forever. Get out and enjoy that white stuff before it turns to water!! 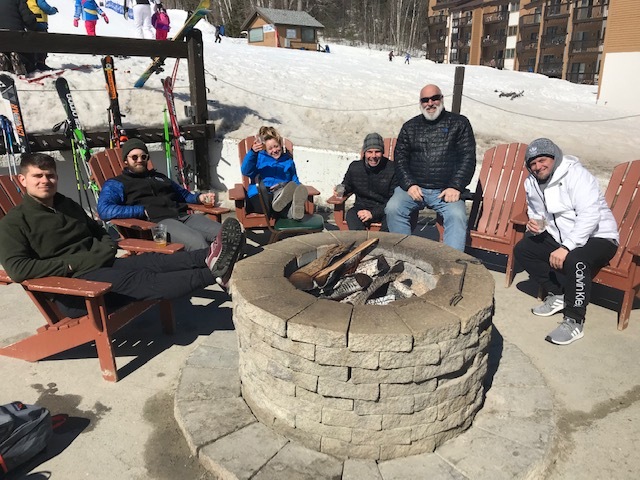 This entry was posted in Snow Conditions, Store Events and tagged okemo on March 19, 2019 by Alan Desbonnet. 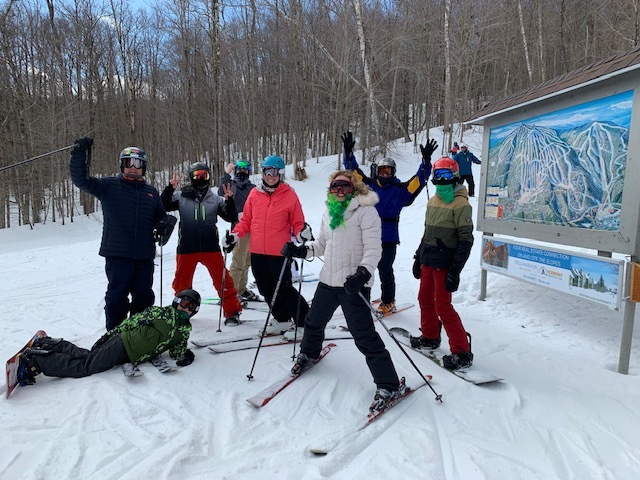 Thirty patrons of Avie’s Ski / Sports ventured forth to Killington ski resort yesterday, Wednesday March 13th, for a bit of skiing and riding. And it was quite a day! Upon arrival, 153 of 155 trails were open for skiers and riders. That’s an impressive amount of territory to play in. If you can’t find something to suit your fancy in that array of trails, time to think about partaking in a different sport. Winds were light to non-existent, and the sun wanted to play hide and seek. Then it just decided to hide, at least until early afternoon. Temperatures were in the high 20s in the morning, jumping into the low 30s early afternoon. It was warm enough where you didn’t get cold, and cold enough where you didn’t get hot. Pretty much perfect in other words. Conditions ran what I consider the typical New England gauntlet for this time of year. Firm and fast early, with those trails that were groomed having some nice crunchy corduroy ribs to sink an edge into. As the day progressed and warmed, the snow softened. Particularly in those areas that were in the sun when it poked through for a mid-day visit. Late in the day, since the sun went back into hiding, most surfaces refroze, providing for some fast last runs. Overall, conditions were ideal. Fantastic even. 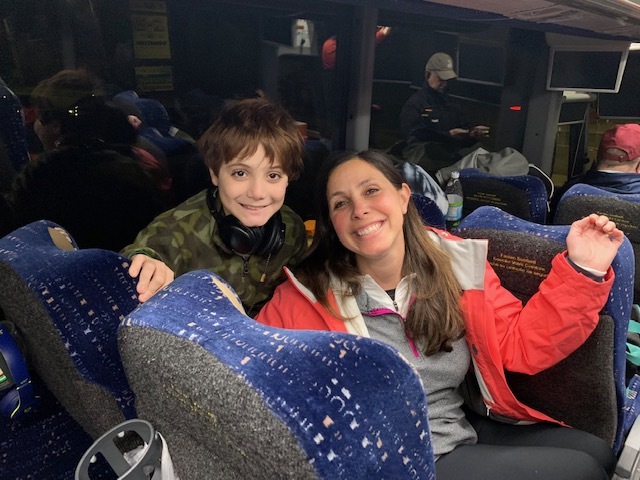 And that was quite evident on the faces of the 30 Avie’s skiers and riders as they made their way off slope and onto the bus for the return trip. All smiles. No grumbles—other than wishing it didn’t have to end. Snow conditions up in ski country continue to be incredible. While northern New England has not seen—at least not yet—the major March dumps of white stuff experienced last year, they have received multiple smaller but significant snowfall events. No bare spots, not many icy patches, and still a ton of snow on the trails and in the woods. It’s mid-March and most ski areas are, or nearly, 100% open! The bottom line is—get out there and enjoy these incredible conditions while they continue. There is still lots of skiing and riding left, but we are indeed on the “downhill slope home” for this season. Avie’s Ski / Sports has it’s well loved—and for good reason—Customer Appreciation Trip taking place this Sunday, March 17, heading to Okemo. Ted comes along and brings all kinds of ski and snowboard “bling” to give away. All of it interesting and all of it useful in some way or another. All the Avie’s staff are also along. Coffee and donuts for the ride up. Snacks and water for the ride home. All in all it’s a really fun time. And there is still space available for the March 17 trip to Okemo. But those seats will not stay empty for long, so don’t dawdle too long over deciding to go or not. The weather looks to be in the twenties on Sunday the 17th, and Okemo is famed for their incredible groomers. Looks to be a good day for ripping up some corduroy!! Join Ted, I, and the rest of the Avie’s Ski / Sports staff for a day of fun. 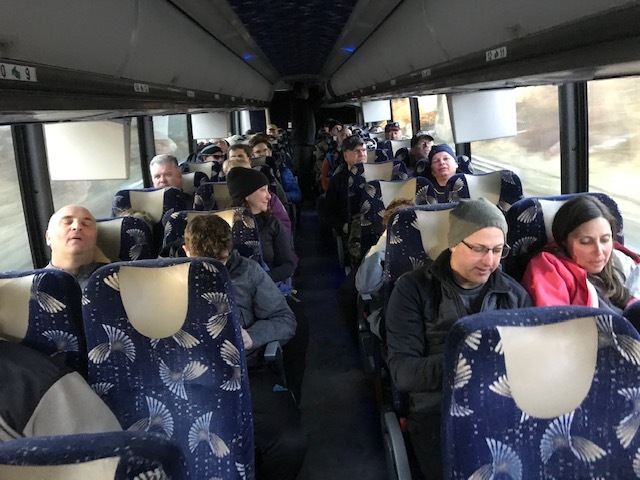 This entry was posted in Snow Conditions, Store Events and tagged bus trip, killington, okemo on March 14, 2019 by Alan Desbonnet. How could Okemo beat that? We weren’t sure, but we were not disappointed. The morning started out cold, about 5 degrees at the base lodge. But the sky was aquiline blue with nary a cloud to be seen. Just a hint of a breeze tickled the trees at the summit. We scooted over to Jackson Gore to start the day. The run down Blue Moon to the lift warmed up the muscles. Then a drop down Quantum Leap under the lift made for an exhilarating start. Allison’s goal for the day was to break the 40 mph mark. That happened on Quantum Leap and her day was off to an even better start. Mission accomplished! We hit all the trails at Jackson Gore, then picked our way back toward the main face, hitting all the trails in the Solitude area on the way. Chief, World Cup, and several others flew by under us as we hit the main face of the resort. The day stayed cold but sunny, and the slopes stayed firm and fast. Conditions were totally different than the day before at Killington. But in a very positive way. Okemo was 100% open, all 121 trails ready for skiers and riders. Most trails were groomed up in the exquisite style for which Okemo is famed. The firm base under the beautiful corduroy stripes made for delicious carving. And carve we did. My feet were nested in Dalbello DS 130 boots, which were clicked into my Volkl RTM 84s. They are a beautiful couple. Carving—at any speed—is done with confidence, fearlessly, and with great joy. Allison was strapped onto her new Ride Saturday deck, carving her way down the slopes with ease and grace. Our only regret was that the day had to end. Conditions up north in ski country are about as good as it gets. So get out and get some of those goods! 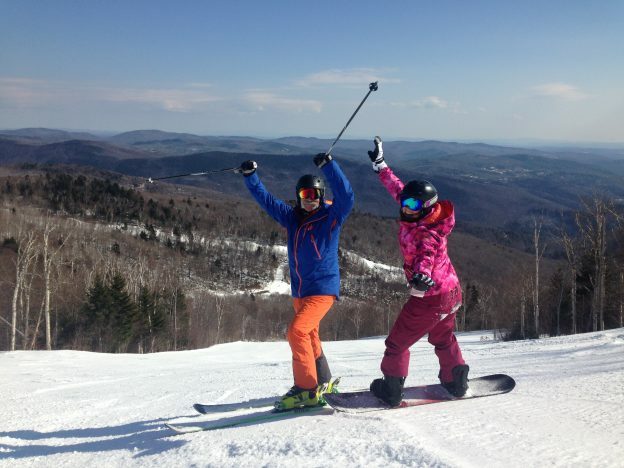 This Sunday, March 10th, the Avie’s Ski and Ride Trip heads to Okemo. You can have the chance to get out and lay down some carves, dodge trees, slide rails, and bounce some bumps. It’s all there and waiting for you. Don’t let great snow conditions slip through your fingers. 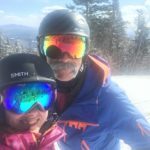 And don’t forget—Wednesday March 13th Avie’s heads to Killington. If you’ve not been to Killington on a weekday when the rest of humanity is at work or school, you are missing one of life’s great pleasures. Conditions are great. Right now. Enjoy! 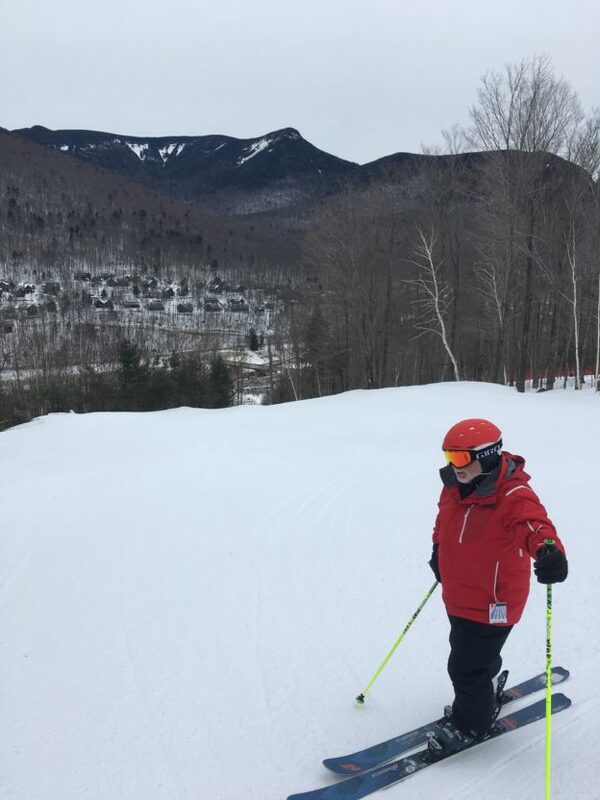 This entry was posted in Snow Conditions and tagged killington, okemo on March 6, 2019 by Alan Desbonnet. I am up at Killington for my annual father-daughter ski and ride trip with my daughter Allison. We arrived late Sunday afternoon and by the time we were done with dinner, it was snowing. And it snowed all night leaving behind 3 or 4 inches of snow. The crowd factor was pretty typical for a weekday. No wait at any lift except the K-2 gondola, which had maybe 10 or 15 people in front of us the really busy time we took it to the summit. Lift lines at the other lifts were nonexistent. Our first run of the day was Great Eastern, summit to base, non-stop. Despite being a beginner trail, with no one on it in front of you, and if you just point the skis down, it can be a fun ride. And it’s a great way to wake up those leg muscles. From there we roamed all over the resort, and there is plenty of space to roam around. It was snowing lightly when we broke for lunch about noon. And the snow simply kept coming on heavier and heavier throughout the afternoon. Our last few runs of the day, over at Ramshed, were through untracked powder an inch or two deep along the edges of the trails. At days end, the view from the Long Trail Pub was such that we could not see even halfway up the beginner slope as Snowshed. It was dumping snow at a prodigious rate. Needless to say it was an incredible day on the hill. According to Allison’s tracking device, we skied more than 25 miles and over 31,000 vertical feet with top speeds of about 40 miles per hour. I honestly don’t know if the numbers are impressive or not, but we sure had lots of fun making them. Bottom line is that conditions are absolutely incredible up here in ski country. Killington was 100% open. All 155 trails ready for someone to play on. It really can’t get any better than that. Toss in the new Snowdon 6-pack bubble lift, a few new tunnels on Great Northern to remove those previously nasty congestion areas, and Wow! is the word. My recommendation is to come get some of this stuff. Luckily enough, Avie’s Ski / Sports is running a ski and ride bus trip up here to Killington this coming Wednesday, March 13th. Remember, March is historically the snowiest month in Vermont. And conditions are already phenomenal. Tomorrow we head south. But there is a stop at Okemo on the way. That helps reduce the separation anxiety that I am sure both Allison and I will have leaving this incredibly snowy, incredibly fun winter playground. 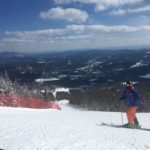 This entry was posted in Snow Conditions and tagged killington on March 4, 2019 by Alan Desbonnet. Went to bed Tuesday night and it was snowing hard. Woke up Wednesday morning to 5 or 6-inches of fresh white stuff on the ground. Fortunately, the bed was in Lincoln, NH. About 2 miles away from the lifts at Loon Mountain. I had the feeling it was going to be a pretty good day. Temperature in the morning was about 30 degrees. By the end of the first two runs I had every zipper unzipped that could be unzipped. Well, almost every. We didn’t want to get too risqué on the slopes. The conditions the day before were great, and the addition of fresh snow made things just perfect. The mountain ops team left a few trails ungroomed. Most trails however, had a nice mix of options. Groomed corduroy was striped down one-half to two-thirds the width of the trail, the remainder was ungroomed. So you could play on either surface. Or both if you wanted to dash in and out along their intersection. I thought that was a really nice touch. A group of “ski testers” from Avie’s were at Loon, testing skis. And then of course there was Matt, the lone “snowboard tester.” But he wasn’t complaining. In fact, he had a huge grin on his face every single time we crossed paths on the slopes. On Tuesday, later in the afternoon, I clicked my boots into a pair of new for next year Nordica Soul Rider 87 twin tips. I stayed on those skis for the rest of the day. They were amazing skis. Light, fun, turny, lots of “pop.” Just plain old big time fun. The Soul Rider 87s took me down the edges of the trails. As it often does late in the day, the edges of the trails are where the snow has piled up. The Soul Rider 87s had me doing super twisty-turny-tight cuts and carves. It was a blast. I couldn’t believe how playful the Soul Rider twins were. At the same time though, they were serious skis. When we went out to the center part of the trail, onto the ice and crust that was scraped clean of snow, I expected them to slide and chatter their way across. But they didn’t. The edges bit in and held in carves across the ice. Wow! The down side of all those tight, twisty-turny carves was a black toenail at days end. It was painful to get my foot into my ski boots the next morning. Very painful. But, we were at “Demo Days” where all the manufacturers are there with gear to try. So I left my boots in the car and went to Dalbello to try out the newly redesigned Panterra ski boots. They had the Panterra 120 in my size, so I slipped into a pair. Demo Days dealer tents at Loon Mountain. The first thing I noticed was that the boots were significantly lighter than previous models. And I do mean significantly lighter. Like maybe a third lighter. Another unique feature of the redesign is that the new Panterra has an adjustable last from 100 to 102 mm. Last is the width of the boot, if you forgot. I liked that adjustable width feature a lot. My Dalbello Krypton 130s are a 98 mm last, so the Panterra boots gave my hurting left toe a bit more room. And because they are adjustable width, I let that toe box be a bit wider than the right foot, which I snugged up more tightly. The result were boots that I could ski in without being tormented by the injured toe. Panterra 120 also comes with the new GripWalk system. This was my first experience with GripWalk on the slopes. Yes, they do make walking in ski boots more natural, and the grippy soles were actually quite nice outside on the snow covered walkways. In fact, they were nice inside as well. The grippy soles never once felt slippery on wet concrete or tiles. They were a bit harder to clip into the ski bindings. But the ski tech at Nordica (yes, I clicked into Soul Rider 87 again—I couldn’t resist, they were too much fun) said that would vary with the fit of boot to binding, and that once the GripWalk pads broke in a bit more, they would slide in more easily. So I would give GripWalk a “thumbs up” as well. The really big news, for right now however, is not about gear for next season. The BIG NEWS is that with the new snowfall up north conditions are really, really good. Bordering on great. Temps look to stay on the cold side up north, which will hold the snow. And it looks like they may get a few small-scale snow events. Just enough to keep things topped off. Just enough to keep the groomers consisting of beautiful packed-powder corduroy stripes. So get out and ski. Get out and ride. Go this weekend. 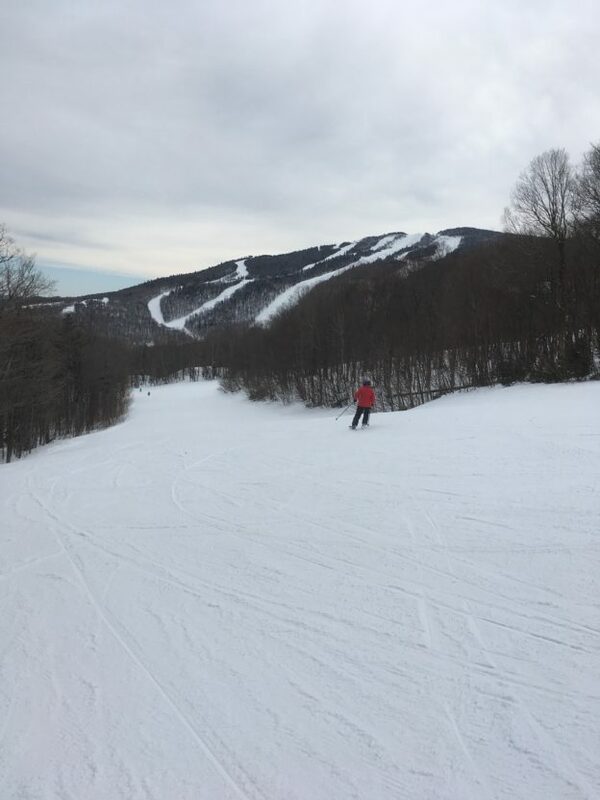 There is still some room on the Avie’s Ski & Ride trip headed to Okemo in Vermont this Sunday, February 17th. If you can—and I highly endorse this—break away on a weekday. Avie’s has a trip to Loon Mountain slated for Wednesday February 20th. I can tell you, first hand, conditions are pretty sweet up there in Lincoln, NH right now. Don’t think about going on one of the Avie’s Ski & Ride trips. Just go. 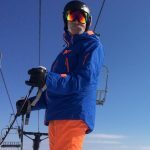 This entry was posted in Gear Knowledge, Snow Conditions and tagged Dalbello, Loon, Nordica on February 14, 2019 by Alan Desbonnet. I am up here at Loon in New Hampshire. The slopes were amazing. Groomed loose granular and packed powder were the snow du jour. Temps started in single digits then topped out in the low 20s to make for a nice day overall. Crowds were thin. No lift lines. Most of my trips north to play in the snow take place in Vermont, mainly because from the Westerly area the traffic is easier to navigate through Hartford and Springfield than through Providence and then Boston. But today, and tomorrow, are a different kind of ski trip for me. It’s one I look forward to each year—Demo Days. 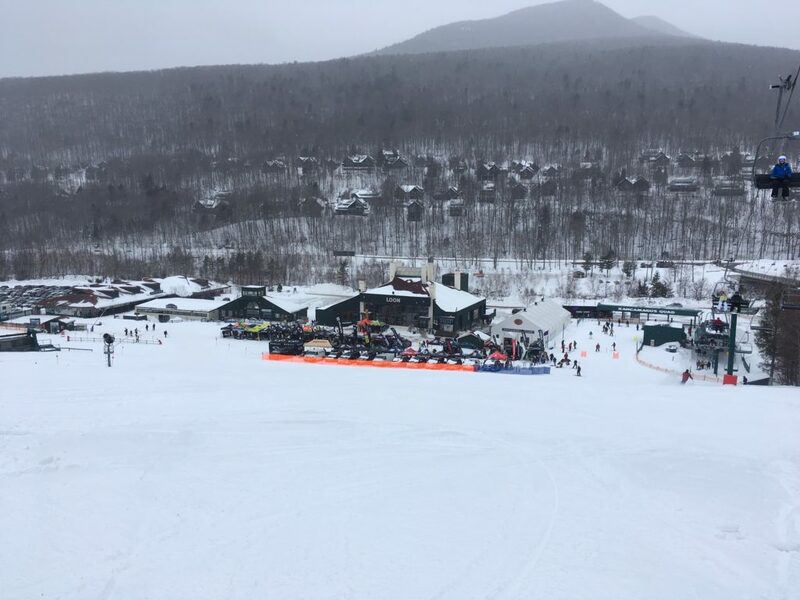 Loon is hosting the eastern session of “Demo Days” as we call it at Avie’s Ski / Sports. Demo Days are when all the major ski and snowboard makers take prototypes of their gear for the next season—in this case the 2019/2020 season—and make it available for retailers to try. So there is a crew from Avie’s up here testing out all the skis and snowboards that you will get to see next season in the shop. Matt, Ray, John, Norm, myself and Ted are all here spending the day testing out gear. It’s the best way for Ted to find out what would be best to have for sale in the shop next season. And to put it mildly, a pretty fun time for all of us “ski testers.” So when you hear mention of ski testers in future posts, this will be the crew in reference. I’m not going to get into what skis or snowboards were great, and what’s new and what’s not. That will come later this fall as we ramp up into the new season of snow. What I will say is that we continue to see some interesting, and smart in my opinion, trends in boots becoming more performance oriented at wider foot widths. And there is a trend in skis that continues towards a greater separation of carving skis and everything else. Both are interesting and good trends. They are good because they will give skiers greater opportunity to dial in the best set of sticks for the kind of skiing they do. Good because skiers with wider feet will be able to get into ski boots that perform better. All good things. Snowboarders will have to await a download from Matt, our sole snowboarder. The biggest news, and the best news, is that ski conditions are really good up north here. While there were some icy patches on narrow trails late in the day, by and large snow conditions were good to great to fantastic. And they are going to get more fantastic. Right now it is snowing up here at Loon. Snowing hard. And the snow is supposed to continue through the night and into tomorrow. When done, there should be close to another foot of fresh white stuff gracing the slopes we slid down today. Yes, tomorrow will definitely be a powder day. We all will grab a pair of fat powder skis and go for a few “yeehaw” laps down the trails. Granted that won’t give Ted lots of great input for what skis or snowboards to carry next season. But that’s what he gets for taking a bunch of snow junkie lunatics to Loon when it’s going to snow. Now is the time to get out and hit the slopes. Go this weekend. You may wander into some of the best conditions to be found this year, so far. Get to Avie’s and get on the bus trip to Okemo this Sunday. There are still seats available. Tomorrow the pictures I take at Loon will be rather different than the one shown here, of Norm, contemplating a final run of the day. It will be a snow day. A powder day. Another Demo Day. Absolutely a great day spent at a great mountain, in great snow, with absolutely great people. This entry was posted in Snow Conditions and tagged Loon on February 12, 2019 by Alan Desbonnet. 5:25 AM—I just crossed the Gold Star bridge and realized I left the Nordica skis home, taking only the Volkl’s. Too far to go back, so I stay pointed northbound. 6:10 AM—I feel the car slipping a bit on black ice on Rte 2 in Glastonbury, CT. Not enough to scare me, but enough to wake me up quickly. 7:30 AM—VT 30 is partially snow covered, but in good shape. The temp is 10 degrees F.
8:20 AM—The parking lot of the Snow Bowl at Stratton has 6 cars parked in it. Are they not open? The Sunrise Express lift is spinning. Therefore the Sun Bowl must be open. I park and grab my gear. 8:25 AM—I rest my skis against the rack outside the lodge and look up the mountain before heading in to suit up. There is one lone ski track sinuously snaking down the face of Sunriser Supertrail. It’s a perfect serpentine “s” in a perfectly smooth coating of powder. I should have taken a picture, but all I could think about was getting onto that lovely snow. 8:45 AM—I’m riding the Sunrise Express lift out of the Sun Bowl staring at the lone track in the powder. Wind is quickly filling it in at higher elevations. “Snow Devils” are whirling about. I see only 2 other people on a chair way up the line of empty chairs in front of me. 9:15 AM—My first “face shot” of the day. No, the powder wasn’t that deep. The slopes came up to greet my face. Also known as a “face plant.” The Volkls think it’s funny to dive deep into the powder. Stratton received about 6-inches or so of snowfall over night Tuesday. Groomers went out early, letting the fresh snow lay down like a blanket over the corduroy. Some novice terrain was groomed just before opening. On those portions of the summit that are severely windblown, you could see some “glacier ice” peeking though—evidence of the nasty rainfall last Thursday. Skiing early on was in fresh powder underlaid with a firm base of mixed granular and packed powder. My Volkl RTM 84′s are not the best in powder. The Nordica NRGy 90s were right there by the door. Don’t know how I could have missed them. And I did miss them. Based on weather predictions, it should have been extremely cold and extremely windy. It should have been cloudy with snow flurries. Yes it was cold—13 degrees F when I left Stratton that afternoon. It was windy. At least early on. Then about 10:30ish the wind just laid down for several hours. It was breezy. Not windy. Clouds? There were a few puffy clouds early on, as you can see in the first photo of this post. But by 9:30 AM the sky was such a brilliant, clear blue that you couldn’t help but just feel that all was right in the world. The slopes were graced with a lovely coat of fresh white powder. Whoops of joy drifted out of the woods, and from the trails hidden from sight behind the trees. Beautiful, arcing curves laced their way down the face of the slopes. As the wind laid down, it was cold, but spectacular. It was one of those winter days that, despite the cold, you just had to feel happy. It was impossible to not be at peace. You just had to smile. Brightly. It was impossible not to breath deep of the cold, sparkling air. And smile. Again. So, the weather predicted was a far cry from the weather received. And equally as wrong, was the expectation of mobs of “powder-hounds,” thick as black flies in spring. See the image below. It was taken about 11:15 AM at the main base lodge at Stratton. Do you even see a person? Obviously there were people on the mountain. But it was incredible how so very few there were. On one trip up the Ursa lift to the summit, there was not one person at the lift to get on but me, and I could see maybe a half dozen people on the lift up in front of me. Even the gondola had no line. Just a small cluster of people waiting to board the next car on the line. I guess folks took to heart the weather predictions. They stayed in bed. Had breakfast. Maybe even went to work, heaven forbid. Doubts crept into my head the evening prior. I kept wondering if it would be worth the drive time to get there and be froze half to death, with the other half getting blown off the summit. On my way home I stopped by to see Greg at Meulemans’ Craft Draughts in Rawsonville, a couple miles south of the Stratton access road on VT 30—a “must stop at” place if you are into craft beer, cider, or Vermont cheeses and wine. Greg confirmed that the locals “stayed in.” He and his wife Pat were out skiing in the morning and noticed that most of the “regulars” were nowhere to be found. Needless to say, it was a great day at Stratton. Spectacular actually. The hills up north have been refreshed with a nice blanket of snow. All that carved up powder will be recycled into groomers for days to come. And conditions will stay good right into the weekend. The “polar vortex” is going somewhere else, so temps will moderate, making things a bit more tolerable. Might not be a bad weekend to head north to ski and ride. 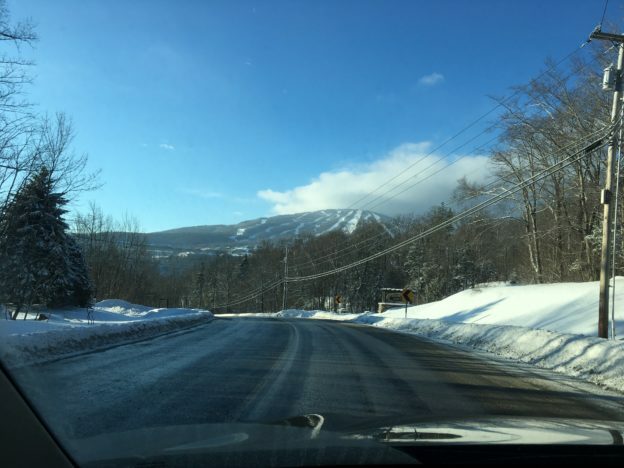 Consider the Avie’s Ski / Sports trip running to Mount Snow on Sunday. But don’t delay. Sign up by end of today to ensure a seat. Breath deep. Smile. Get out and enjoy the snow. 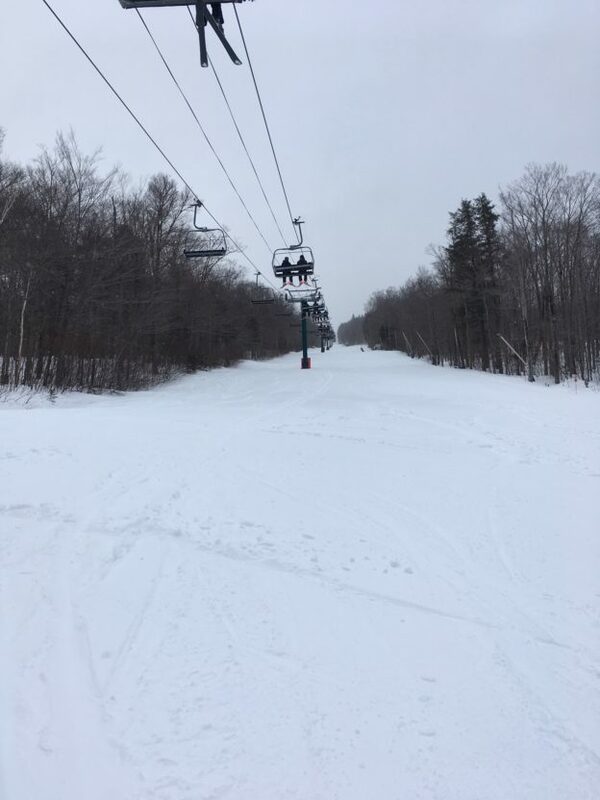 This entry was posted in Snow Conditions and tagged Stratton on January 31, 2019 by Alan Desbonnet.